My Grevillea Series has been rolling along for a while now and before I launch into Number 10, I thought it would be a good idea to review progress. Looking back and seeing the work all together is helpful with new directions and new ideas ... not to mention that it makes me get my photo files into order and update my art database!! The first piece turned out to be a disaster from a technical point of view! The issue related to layering fabric over the printed organza making for a very unstable piece when it came to the stitching!!! However I like the color and design ideas and this piece remains on my design wall for inspiration. 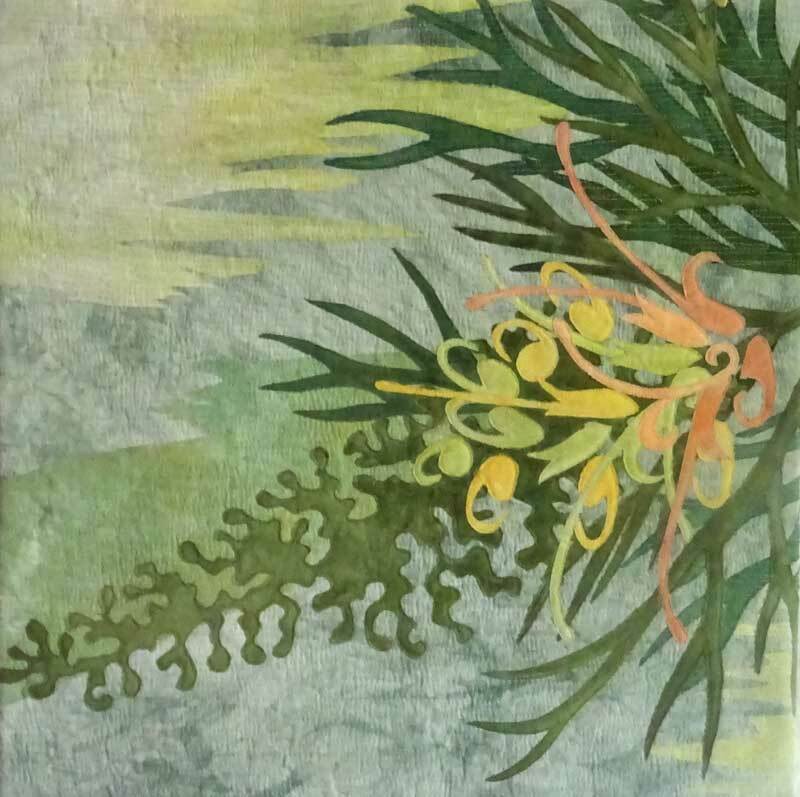 After that experience, I stuck to applique and reverse applique (with no fancy fabrics) with a good result and second grevillea is part of the SAQA 2017 Trunk Show. In the Pink Grevillea piece I was determined to master the organza, because I really like the effect of printing on it, and tried a variety of flower shapes. This was a good learning experience but it lacks something from a design perspective! In the middle row ... the stylised fower design and development of the backgrounds by incorporating hand printed fabric has worked well and I am really pleased with these. Peaches and Cream was part of an exhibition at Kangaroo Valley and now hangs in a new home! Recently I have been exploring a more abstracted flower design in the pink/purple pieces and have returned to the original idea of stitching the flower design ....... with much more success! The final two pieces use the backgounds I made a couple of weeks ago, now stitched and appliqued. I think the blue/green/yellow piece is the most successful. While I contemplate what next, I would love to know which grevillea you like best? ?